Britain is the Preferred Platform for Chinese Businesses to "Go Global"
On 15 September, the Second International Capital Conference of the Boao Forum for Asia was opened at Central Hall Westminster London. Ambassador Fu Ying was invited to attend and address the meeting. Chen Jian, Vice Minister of the Ministry of Commerce, delivered a keynote speech. Other speakers included Long Yongtu, Secretary General of the Boao Forum for Asia, Lord Neil Davidson QC, Advocate General of UK and Alderman Ian Luder, the Lord Mayor of the City of London. 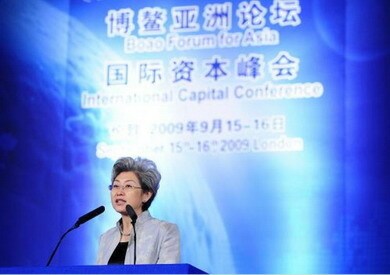 Ambassador Fu Ying said in her speech, the second presence of Boao Forum for Asia and many Chinese businessmen in London a year later demonstrated fully that despite the financial crisis, the Chinese business community is still confident of London’s status as the international financial centre. She said, one year ago along with the bankruptcy of Lehman Brothers, the financial crisis hit every corner of the world; one year later, we are gathered here to discuss ways of sustainable recovery of the world economy. The harsh winter following this crisis is not yet over, but will be with our concerted efforts. Fu Ying briefed the guests on the stimulus package issued by the Chinese Government in response to this crisis. She also hoped that in the upcoming Pittsburgh Summit, countries can coordinate positions to achieve a world economic recovery. She said, at the crucial moment for global economic recovery, China and the UK should draw from each other’s experience and work together to facilitate reform of international financial institutions, contain trade and investment protectionism, foster new growth points and address climate change. Fu Ying said, businesses are at the frontier of bilateral cooperation and constitute the most fundamental, dynamic and resolute force of bilateral relations. Boao Forum for Asia has provided excellent opportunities for more direct contacts and interaction and investment cooperation between business sectors in the two countries. She pointed out, UK is the world economic and financial power with a comprehensive legal system, highly liberalized market and sophisticated financial service sector. London is one of the world’s financial centers. Hi-tech, design and managerial experience that the UK has to offer happens to be what is needed by businesses in China. Therefore, the UK is the preferred platform for Chinese businesses attempting to “go global”. The first International Capital Conference of the Boao Forum for Asia was convened in June 2008 in London. This year’s conference gathered over 200 attendants from government and business sectors in the two countries. A two-day discussion was held on global development opportunities for Chinese businesses and opportunities that China’s financial liberalization can generate for western companies.